The report --The Bold, The Beautiful and The Brilliant-- lists out top 20 Indian celebrities with highest brand valuations and reveals that the overall brand value of these Indian celebrities in 2018 stood at $877 million. 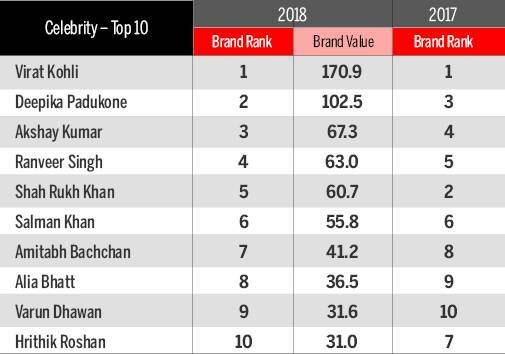 The report provides a ranking of India's most powerful celebrity brands based on brand values derived from their endorsement contracts. The report highlights that film stars dominate the endorsement industry with the maximum takeaway of 76 per cent, followed by sportspersons and TV actors who take 12 per cent and 9 per cent of the share, respectively. The remaining 3 per cent is taken up by others. 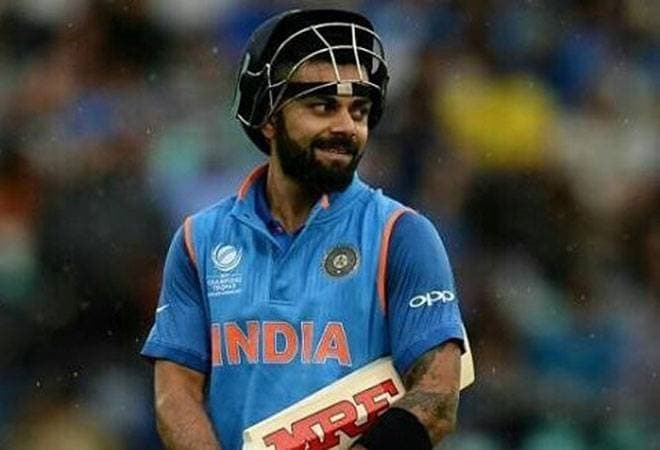 "Even as per our analysis of the top 20 celebrities, 16 of them are leading film stars whereas 4 of them are sportspersons," the report says. "Product brands are also looking for better returns on their investment when it comes to regional markets and have therefore started coming up with region-specific commercials featuring regional celebrities," it says. The regional celebrities with most endorsements in 2018 were: Mahesh Babu (15), Tamannaah (8), Diljit Dosanjh (6), Rana Daggubati (6), Shruti Haasan (6), Allu Arjun (3). 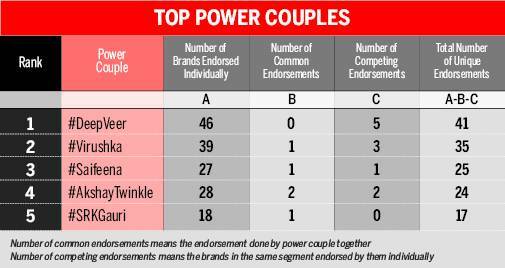 The report also talks about Emergence of 'Power Couples' and says that by tapping into a power couple's reach and impact, brands can target each partner's unique following and voice. "The coming together of a power couple creates a larger platform that brands want to leverage to target the youth. The report also mentions growing trend of celebrities increasingly being leveraged to create social media buzz. A celebrity's hold on social media is now a major determinant of the influence that he or she can have over a brand campaign, it said.